SpaceX is developing reusable Falcon 9 rockets to make spaceflight more affordable. 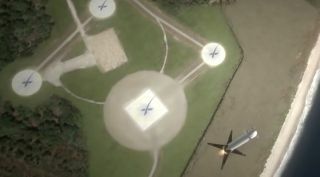 The company plans to land the first stage of its Falcon 9 rockets (shown in this animation still) at its Landing Site 1 at the Cape Canaveral Air Force Station in Florida. CAPE CANAVERAL, Fla. — SpaceX may try to make history with its next launch later this month, returning its rocket to a landing pad rather than an ocean-based platform, a NASA official said today (Dec. 1). Prior to the June rocket failure, which resulted in the loss of an unmanned SpaceX Dragon spacecraftbound for the International Space Station, SpaceX had twice attempted to land a Falcon 9 booster on an ocean-based drone ship. Both times, the landing failed in the final seconds, resulting in the booster hitting the platform and exploding. If SpaceX does attempt and succeed at landing its next Falcon 9 rocket's first stage at Cape Canaveral Air Force Station, the feat would come just a few weeks after rival commercial spaceflight company Blue Origin similarly landed its New Shepard rocket after lofting an uncrewed capsule on a suborbital flight. Robert Z. Pearlman is a Space.com contributing writer and the editor of collectSPACE.com, a Space.com partner site and the leading space history-focused news publication. Follow collectSPACE.com on Facebook and Twitter at @collectSPACE. Follow us @Spacedotcom, Facebook and Google+. Original article on Space.com.